It's now 30th December and I'm pleased to report that we survived Christmas. I was absolutely dreading it and had discussed it with the head nurse at the nursing home where Mum has been a permanent resident since 4th December this year. She said that there is no need to take the residents out on Christmas Day if it's going to be too traumatic for everyone. *Bring an esky of Christmas food and have either lunch or dinner in one of the nice outdoor areas, where you can even have a barbecue. *Taking them 'home' for Christmas can just increase their agitation and make them unsettled. I agree with all this, but several months ago I'd purchased tickets to a private function at the Italian Club on Christmas Day. So I decided I'd take her there and back to my place to see the cat afterwards. It was going to be a very grim Christmas for me. No visitors expected and I was too exhausted to even put up the tree. I couldn't be bothered taking Mum shopping to choose presents for me this year and then wrapping them myself, so I knew there'd only be two presents for me under the tree. For her grandchildren, I got her to write out cards and I put $50 in them. Anyone over 21 doesn't receive Christmas money because it has to stop somewhere. Anyway, the nursing home takes most of her pension and superannuation payments so she can no longer afford to be generous. As it happened, a friend riding his motorbike from Melbourne to Brisbane for Christmas (a distance of 1800 kms or 1200 miles) contacted me on Christmas Eve to see if he could stop over due to storms in the area. Talking of cards, surprisingly, her handwriting is still good and she can still spell. So as long as I told her exactly what to write, she managed to reply to the few cards that came in. For the first time in 30 years, I'd be on my own and not cooking a baked dinner for anyone. I felt very lost. So the prospect of going to the Italian Club on Christmas Day was at least something to look forward to. I left a note for the nurses to dress her in her beautiful Leona Edmiston original dress that she wore to my daughter's wedding. They tried, but when I arrived, she was wearing jeans and a blouse. They said she stated, "I wouldn't be seen dead in that dress." 'That dress' cost close to $2,000. It's in the picture below. Mum had absolutely no idea it was Christmas Day. When I told her, she said, "I thought Christmas was over weeks ago." I suppose this might be because of all the Christmas parties and activities at the nursing home in the days leading up to it. In case I didn't mention it before, Mum became a permanent resident there on 4th December. Mum wasn't very happy, but I told her either she put on the dress or we didn't go anywhere. She finally agreed. It took ages to get her into that dress. For starters, she'd undone every single button - the buttons are basically meant to be decorative. She then objected to wearing her gold sandals and wanted to put on socks. I just kept insisting, we get dressed properly for Christmas dinner or we don't go anywhere. She made a few nasty remarks about me 'dumping' her in 'that terrible place' with all those 'mad people' when there's 'nothing' wrong with her. I also got her to put on some jewellery and finally, makeup. This wasted a lot of time and by the time we drove all the way across town, there was only ten minutes of church left. That was probably a blessing anyway, because I've basically given up taking her to church. After fifteen minutes she'll say loudly, "Get me out of here. I don't like it." 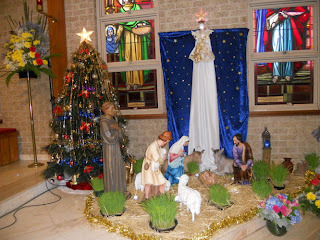 At church we lit a candle and then went out the front to wish Father Ron a happy Christmas. He replied he intended to spend the rest of Christmas horizontally, being all Christmassed out. Father Ron is multi-lingual and was wishing everyone a happy day in many languages. Next year I swear I'll find a language he can't possibly know and really stump him. After church, we went on a drive past the harbour and the fishing boats. This was a drive Mum's father used to love to do on Sundays and she remembered that. Then it was time for Christmas dinner. 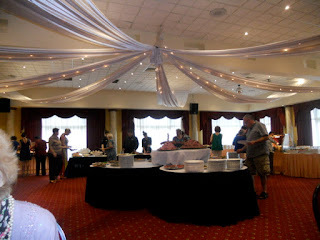 It was a fantastic smorgasbord of seafood from the Italian fishing families, roast pork, beef and lamb, baked vegetables, salad, huge Barramundi from the Northern Territory and traditional Italian desserts. 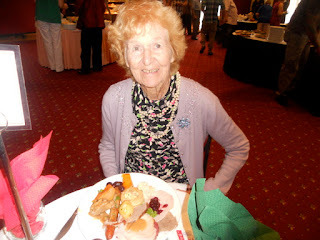 I piled Mum's plate high and was very pleased when she ate the lot without much complaint. After lunch I took Mum to see her parents' grave. She was very vague by that time. She kept asking, "Who's buried here?" We walked through the cemetery and she asked, "Aren't we going to see my father's grave? Where is he buried?" Her short term memory mostly only lasts a few seconds now. We took the dogs for a quick walk down near the beach. They had their presents too - rawhide bones and new rolled leather collars. It was quite a hot day, but many Christmas days are scorchers here, so it wasn't too bad. At my house, she sat on the veranda with her cat for a short while. She used to stay there for an hour or more up until a few months ago. Now she only lasts a few minutes, before asking, "When are we going out to eat? Why don't we ever go to the shops?" 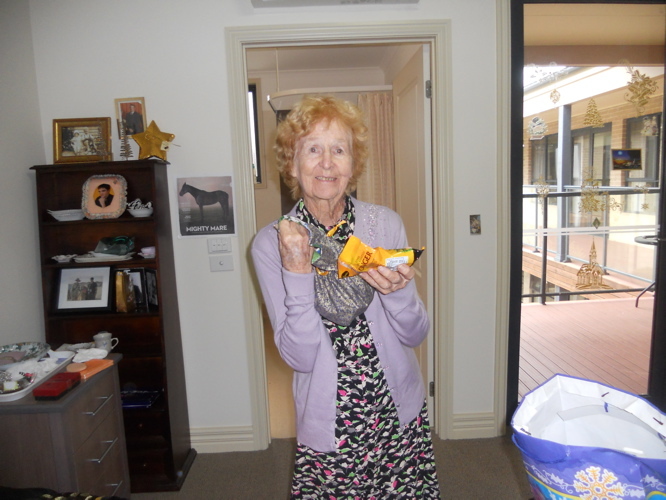 On the way back to the nursing home, she asked to go to lunch or to the shops over and over. I had to keep repeating, "It's Christmas day Mum! Nothing is open and we had lunch at the club!" to which she'd reply, "I thought Christmas was over weeks ago." She started to get nasty to me a few times on the drive back but I'd reply, "Don't you ruin my Christmas day!" and she'd stop. Back in her room she opened her presents. She wanted me to take them away in case someone stole them. 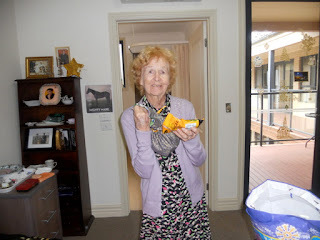 I gave her chocolates, biscuits and some pale lipsticks that she can't use to write all over the walls as she did once. She keeps writing my phone number everywhere and if there's no paper she writes on walls and even curtains. She must think I don't know she's there and someone needs to ring me to come and pick her up. How she remembers my phone number is a complete mystery. She wasn't happy when I left. I left her at her table in the dining room ready for dinner at 5 p.m. But overall we did a good job surviving Christmas Day. I just hope next year it won't be quite as dreaded in anticipation. Mum in her room on Christmas Day. The horse in the photo is Black Caviar. You can see the nice balcony where she's allowed to have pot plants. Just read this and I am glad she has been in that place since Dec. 4th. 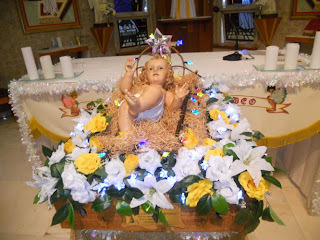 I remember a sad Christmas when my mother had just died and my father was in the hospital. We both cried in his room. Somehow we have special expectations for Christmas. We didn't put up a tree either, went away, and kept things simple. my son and his wife celebrated without family. A cousin spent the holidays by themselves as their newly born baby isn't ready to be around the numerous amount of people that they know. 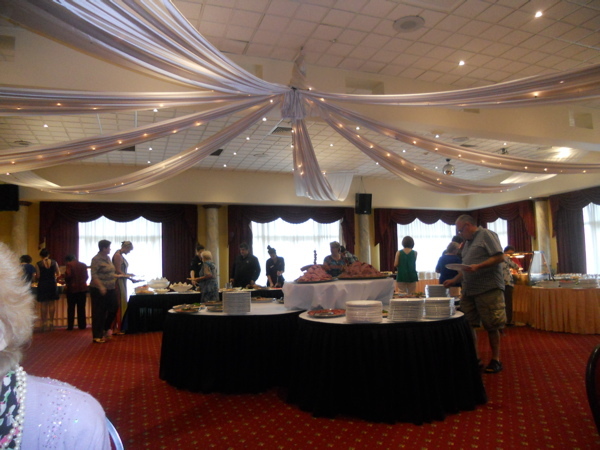 My family celebration went down from eighteen to five. Mom has been oblivious - fortunately she doesn't seem to display meanness or hostility. Nothing wrong with the change, I guess. Just different. Feels empty. I am so glad that you had a surprise visit from your friend (from Melbourne?) and that you were able to share the holidays with someone who will remember. I'm happy to hear that you have found a place for your mom and that you are able to go back to role of her daughter and not just her care giver. Because that takes a mighty tole. I am going through the exact same things you have explained in your blog and care full time for my mother who is only 68. Have you looked into and tried coconut oil? I have had some great response from this, so wanted to share it with you.